Heat the oven to 425°. In a small bowl, combine the mustard seeds and Dijon mustard. Cut a pocket, horizontally, in the side of each chop. Spread the inside of the pockets with the mustard mixture and stuff each with a slice of the cheese. Close each pocket with a toothpick or small skewer. Put the chops in a baking dish and sprinkle them with the pepper. 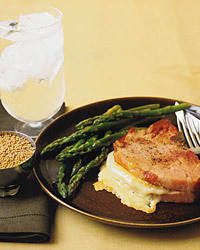 Bake the chops until the cheese melts, about 15 minutes. Remove toothpicks or skewers before serving. A crisp, dry, but full-bodied white, such as a Mâcon-Villages, from the Burgundy region of France, will be terrific with these chops.